The creatures in these books are not ones I am familiar with and that can be a risky thing for an author, as it can be easier to stick to those monster we love more, vampires, witches, werewolves etc. Moving away from the familiar can sometimes be disastrous, but this is a fantastic triumph. I found it extremely easy to identify with the main character Katie, as I am sure most people will be able to. She's fragile, yet plucky and the poor girl just can't catch a beak, something I think we've all felt a one time or another. I'm not much of a romance fan, I like a good story line, if romance is part of it then fair enough, but romance and sloppy stuff is not really my thing. I was dubious about this as Vincent seems to fall so quickly, but without giving too much away. I think once we discover his past it seems plausible. 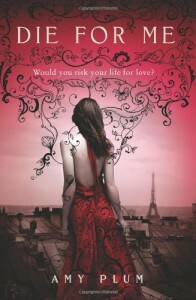 Being set in Paris there is some beautiful imagery weaved by Amy Plum, I have never been to Paris, but felt like I was there and I would not be surprised if many people did not make the trip after reading this book. All in all a good read and highly recommended.